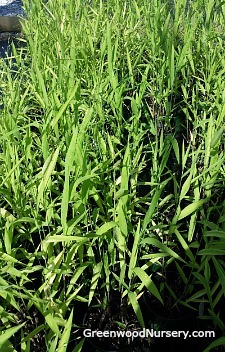 Northern Sea Oats Grasses will grow in wet soil. One of our more versatile ornamental grasses, Northern Sea Oats will grow in areas of full sun into part or light shade. Plus, it tolerates average to moist soil types. With seed heads similar in appearance to the agricultural oats, Chasmanthium latifolium is native to the mid western states. Leaves appear in spring as bright green turning to a bronze shade after fall frost to brown for the winter months. Prune back your Northern Sea Oats to the ground in late winter or before plant begins to produce new growth in early spring. Northern Sea Oats ships as a one gallon container grown plant. Height will vary according to the time of year shipped. Orders shipping to AZ and CA will be bare rooted before getting prepped for shipping.